The dye logwood or blackwood is extracted from the heartwood of logwood trees (Haematoxylum or Haematoxylon campechianum) that come from Central America. Logwood dye was introduced into Europe by the late 1500s in the form of logs, hence its common name. Logwood’s main use is for dyeing textiles and leather, but it is also used to produce the stain haematoxylin for microscopic slides. Logwood is an easy dye to use, producing violets, greys and blacks. A plantation of logwood trees in Jamaica in 1875. Avenue of logwood trees in Cuba in 1916. Logwood belongs to the legume family and its scientific name means "bloodwood" (‘haema’ meaning blood and ‘xylon’ which means wood). Logwood is a gnarled tree with a deeply fluted trunk. It is usually about 8 metres high but can grow up to 13 metres tall. 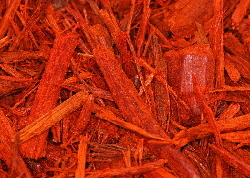 It is the blood-red heartwood that is used for dyeing. Logwood is not threatened with extinction, as it grows abundantly and produces large amounts of seed before it is ready for cutting. Although usually harvested by cutting the tree, it can also be harvested by coppicing. A native of the Yucatan peninsula in Mexico, today this tree has become naturalised in much of the Caribbean and other parts of the world. The dye haematoxylin is very similar to brazilin from brazilwood. It was fashionable in Europe to wear black and it was easier to get black from logwood than from indigo and madder. Logwood was first exploited by the Spanish in the Campeche Bay in Mexico. From the 17th century to the 19th century, logwood was a commodity of great economic importance both in the Caribbean and in Europe. Hundreds of tonnes of logwood were exported and the ships carrying it were a constant target for pirates. The country of Belize (ex-British Honduras) grew from English logging camps exporting mahogany and logwood.